The Powd’Air ski uses the same construction as its little brothers the Xplor’Air and the Crus’Air. The specially designed carbon frame offers the performance of a 100mm without the excess weight, making the up a little easier and allowing you to save your energy for the fun part: going down! Pro-Tip Rocker features a combination of progressive shape and increased tip height and radius. SCOTT's Pro-Tip produces a more consistent ski flex and predictable turns. SCOTT skis using Pro-Tip Rocker simply track better than the competition and are available in three heights, catering specifically to the skis' intended use: 300mm (Precision On-Piste), 350mm (All-Mountain) and 375mm (Freeride). SCOTT’s SSCL Carbon is a result of a carbon experience and heritage. The combination of a sandwich wood core construction with carbon laminates results in a lightweight performance construction with triaxial carbon fabric ideally suited for ski touring. Traditional skis have a fixed radius that determines the length of every turn. SCOTT skis combine two radii (dual radius) to create the sidecut or “shape” of the ski. By incorporating the Dual Radius concept, the ski can turn when you want it to turn, resulting in a more versatile ski which is not confined to one type of skiing or terrain. 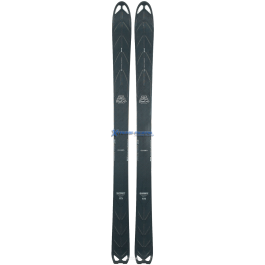 This innovative carbon laminate ski construction creates an exceptionally lightweight touring ski while dramatically increasing torsional rigidity and dynamic performance on steeps. By incorporating a progressive tip height radius, SCOTT skis simply track better than the competition. SCOTT's Pro-Tip produces a more consistent ski flex and predictable turns. Pro-Tip is available in three heights 300mm (Precision On-Piste), 350mm (All-Mountain) and 375mm (Full Freeride).